There is a lot of chaos in the immediate aftermath of a natural disaster. Trucks rush in with bottles of water and emergency supplies. Media pours in for a few days and covers the wreckage. Facebook pages are littered with horrific images of destruction. Then, many move on to the next big news event. And left behind are the residents who have to pick up the pieces, often with little or no help, especially in those smaller towns and other areas upon which no one shone a spotlight. The small, unincorporated community of Laplace, La., in St. John the Baptist Parish is one such place. When Hurricane Isaac struck Louisiana in late August, it was a mere Category 1 storm. Unfortunately, it was in no hurry to leave the area and pounded the southern area of the state with wind and heavy rain, leading to flooding in many areas. One of the hardest-hit areas was Laplace, though it got little if any attention in the immediate aftermath of the storm. But it caught the attention of the Fuller Center Disaster ReBuilders. “Our mission is to go into disaster areas when it’s time to begin rebuilding. That time has arrived,” said Bart Tucker, now the president of the Disaster ReBuilders. And the Disaster ReBuilders’ focus will be on Laplace. Leading the effort in Laplace will be new Disaster ReBuilders Executive Director Paul Alford. The ReBuilders didn’t have to go far to find him. He teaches a Sunday school class with Tamara Danel, acting director of the Ginger Ford Northshore Fuller Center for Housing. Alford describes St. John the Baptist Parish as an area rich in Louisiana tradition with many skilled workers employed by oil refineries and chemical plants, along with those who work in nearby New Orleans just to the east of the city. Unfortunately, the parish and particularly Laplace were uniquely situated to take some of the worst flooding from Isaac. 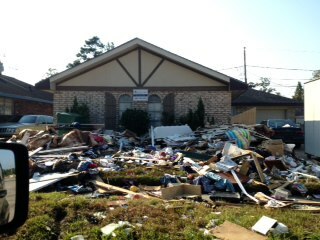 And that spelled disaster for St. John the Baptist Parish. But an estimated 6,000 to 7,000 homes suffered flood damage, some as much as 3 to 5 feet. The farther south from Lake Pontchartrain, the less flooding homes received. And between FEMA grants, flood insurance and other financial means, many families can handle their own recovery. But not all. “The more well-to-do neighborhoods either had flood insurance, or their owners had the wherewithal to rip out the insulation and drywall and repair their damages and are back in them,” Alford said. “We won’t have any work in the nicer, higher-dollar subdivisions of maybe 3,000-square-foot homes. But when you get into the neighborhoods that are 20 and 30 years old, filled with homes that might be 1,000 or 2,000 square feet, low- to middle-income families, every home was inundated with water. Tucker, who is in Massachusetts facing a storm of his own as Hurricane Sandy threatens to collide with a winter system in the Northeast to create what is being called “Frankenstorm,” said that the Disaster ReBuilders’ efforts in Laplace are unique compared to previous rebuilding efforts because they are teaming up with Danel’s Ginger Ford Northshore Fuller Center. He said that with Ginger Ford Northshore’s partnership, they are ready to get started and are looking for volunteers and donations. He added that Alford is well-qualified to get the most out of support that comes the way of Disaster ReBuilders. Groups and individuals wishing to support the Disaster ReBuilders or seeking more information can email Alford at dpalford@msn.com or Tucker at bartowt@aol.com. Click here to support the Fuller Center Disaster ReBuilders.